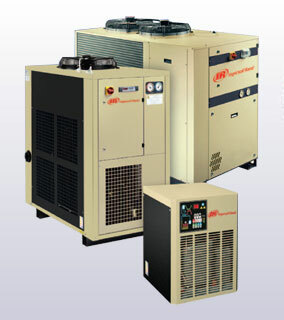 Refrigerated dryers from Ingersoll Rand offer multiple design features to ensure a constant dew point at all load levels and will deliver a continuous dry air performance that satisfies ISO 7183 industry standards. Multi-stage filtering helps remove residual contaminants. Using refrigerated dryers from Ingersoll Rand will provide clean, dry air which means less corrosion in the air distribution system, less damage to air-powered tools and reduced potential for contamination in production process. Ingersoll Rand offer multiple design features to ensure constant dew point at all load levels and will deliver continuous dry air performance that satisfies ISO 7183 industry standards. Ingersoll Rand’s refrigerated dryers provide the very best combination of high efficiency, low pressure drop and small footprint which reduces power consumption, reduces installation time and facilitates maintenance.